For demonstration purposes I prepared a sample workbook, where source is in named range “UglyTable” (I was ruthless). You can download it here. The first solution (looking obvious) for this task that I found after some googling and thinking was using of “append queries” method. Extract first group of columns (included common columns and first repeating group of columns). Extract second group (included common columns and second repeating group of columns). Make sure that second group has the same column names as first. Although it can be done with UI on all stages, this method has a lot of manual work. When performing it with UI only, you need to create as much queries as number of repeating groups you have, and then append queries one by one in corresponding number of steps. In sample code above I shortened this steps and place it in one query, but it takes a lot of editing. And the main lack of this method is that whether number of groups changed, you need to add/remove some queries and edit last step (appending). So this solution could be made if you sure that table’ structure will be the same all time long. As I was dissatisfied with the first method, I resumed googling and then asked Gil Raviv (a Microsoft fellow who runs Get & Transform Data in Excel 2016 blog on TechNet) in Twitter. He supposed another solution, based on a little tricky instrument he used when unpivoting nested tables. Repeat this step for each pair of columns shall be stacked. Unpivot all of these merged columns. Split unpivoted values by delimiter used. Make clean-up in table and make-up data. I love this trick – it is really interesting and not obvious. The idea is simple: as we cannot just unpivot this table because we have more than one column of the same data, we merge these columns in one, and then we get a pack of columns that can be unpivoted in usual way. And all we need then is just split data to separated columns. Actually this method could be performed with UI only, there are no need to manually edit any string in code editor. And it is fast when refreshing, too. This approach I do not peeped and “invented” myself (although I’m sure I’m not the first one), so I proudly present it here. Promote headers (note that as columns headers initially has same names, Power Query adds numeric indexes to them because columns in a table should have different names). Column names moved to “Attribute” column. 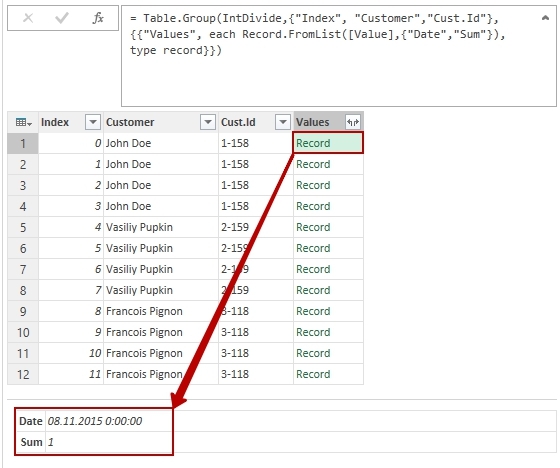 If they will be the same each time (“Date”, “Sum”) and has not index added to name by Power Query, it will be very easy to pivot this table by these names. Unfortunately, we can’t. 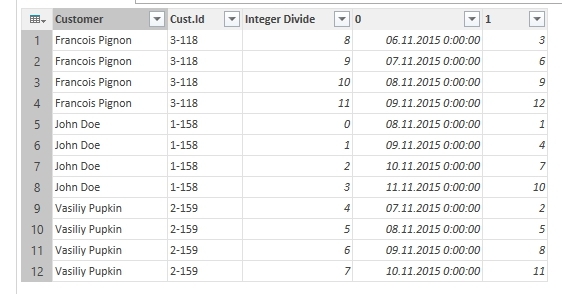 Add custom column: use Add column – Standard – Integer Divide (divide by 2). We’ve got additional column with the same index for each pair of rows. 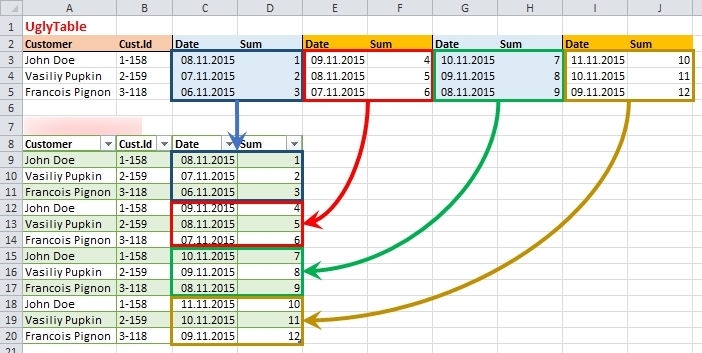 Add another custom column: Add column – Standard – Modulo (divide by 2). We’ve got a column where each row has repeating index 1 or 0 – it will help us to group them. Unpivot “Inserted Modulo” column (select “Value” column as values and do not aggregate). Now we only need to remove “Integer Divide” column and rename columns “0” and “1” to “Date” and “Sum”, and apply appropriate data types. This method could be applied on tables with any number of paired columns. This is main difference form first two approaches: it doesn’t matter whether number of columns increase or decrease, after unpivoting we will work with rows. The first time I saw this trick was on Power Query TechNet forum, when Ehren, another good Microsoft fellow, used it to collect values from one column when grouping by values in another. I adopt it to this case, and it works perfectly. Unpivot al columns except common columns. Now our repeating columns becomes repeating groups of rows. Transform “Index” column with use of Number.IntegerDivide function. This can be done manually or with UI: Select “Index” column, go to Transform – From Number – Standard – Divide (Integer). Our goal is to get whole number of “Index”/2 (as we have two repeating columns). Now each pair of row has the same corresponding number. 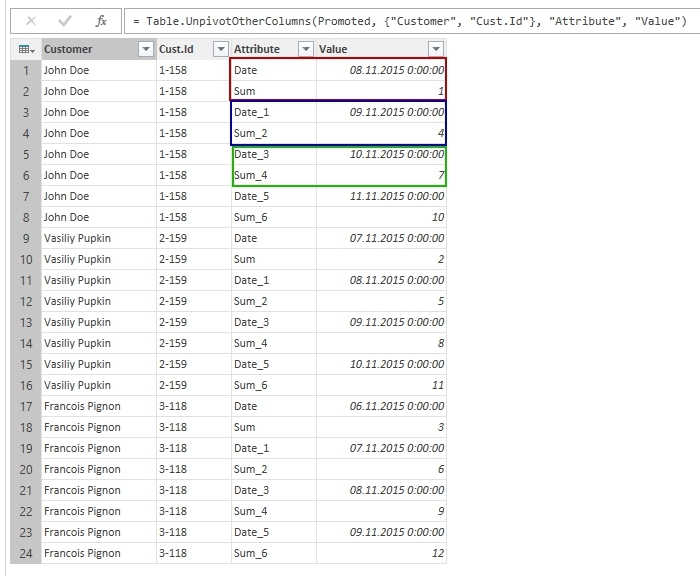 it creates a Record with two fields: “Date” and “Amount”, taking them sequentially “top-down” from the selected rows. And what we really have as a result of aggregation is a value of record type for each of grouped rows. The Record.FromList function itself allows to create a Record from list of values and a list of corresponding fileds names (as a second argument this function can take a value of record type, which allows to apply data types right inside function). Now we can remove “Index” and expand “Values” column by clicking on double arrow right to column name, and we got the table we need! Make sure all data has correct type assigned, close & load. As I told before, this approach is very interesting and useful for understanding some M language concepts. 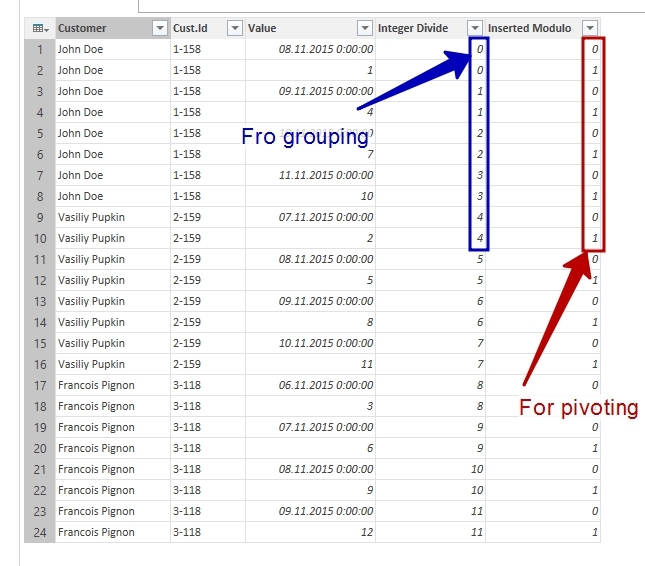 Also for this “group to records” trick doesn’t matter, how many columns we will unpivot and group: 4, 8, 98, etc., so this approach is more versatile than first two. Every of these methods is suitable for different cases, but I prefer last two: they are more versatile and could be used on table of any size. If you not familiar with Power Query “M” language, it is supposed to use third method: modifying indexes for grouping and pivoting. But “grouping to records” method is more technological and fast, so if you don’t afraid to edit M code, this is recommended approach. I still don’t sure whether these results are really average. Try it yourself too. The link to the UGLY data spreadsheet is broken. this is a really beautiful portrait of different techniques. No index, no group, no calculate. Trick is to pivot without aggregation. Warning: This wouldn’t work if you’d remove the “Attribute.2”-column before pivoting, as a non-aggregated pivot needs a unique identifier. Nicely done! One of my first attempts was based on using trimmed columns names to pivoting, but somehow I decided not to mess with it. But your solution shows me that I was on wrong way. I like your trick with Pivot+FillDown here – it seems not so obvoius, but very nice. That is why I love PQ – you can find not only correct, but also elegant solution.